See the most successful basketball coach in history discuss her life since leaving the court to battle dementia. Hear about her new book, "Sum It Up". Robin: She is quite simply the most successful basketball coach ever. A legend with 1098 wins and 8 NCAA National Championships. Such an unstoppable force that when she made the stunning announcement that she had been diagnosed with early onset dementia, it sent shock waves around the country. In a new ESPN documentary, the normally stoic Pat breaks down, discussing how difficult it was to decide to step down at Tennessee. Pat Summit: It was hard. You know, because I didn't -- I didn't want to, but I felt like I needed to step down. Pat: Oh. Hey, Robin. How you doing? Robin: Oh, Pat, so good to see you. You said that hearing numbers and things don't mean as much. But you see a player, it will spark a memory. Pat: Oh, yeah. Judy Rankin was a hoot. 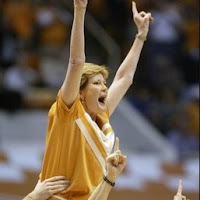 Pat is the Head Coach Emeritus of the Lady Vols, attending practices and all the home games. Robin: What do you miss most about coaching? Pat: Being on the court. Robin: This is so pretty. She still drives herself to practice, cooks, and takes her beloved labs, Sally and Sadie, for daily walks. I had chance to catch up with Pat at her home in Knoxville to talk about her new boom, summing up an incredible life. Robin: The book is beautiful, Pat. When you said, "Sum It Up," you summed it up. "Sum It Up" is a memoir. A deeply personal glimpse into the story behind this legend. The story of a little girl who grew up dirt poor on a farm in Tennessee. So poor, the story go, her daddy had to sell a mule to get the money to marry her mama. And you slept in the same crib until you were 6 years old. That was poor. Pat: Yes. And I was pretty long. Robin: Long, as in tall. And with three older brothers, she learned to play basketball, got tough, and good. So good, that she played in college and even went to the Olympics. Robin to Pat: You saw the world. Robin: And the book explores the complicated relationship with her father. A man who loved her dearly, but had trouble expressing the affection he felt for his children. He couldn't say the words, "I love you." Robin: You were 43 years old, won another National Championship. And what you remember most is, climbing into the stands, and what did your daddy do? Pat: He gave me a big old hug. Said he loved me. And he also said, I don't want to hear anything else about this anymore. Robin: Pat says that was the first time her daddy hugged her. Ask Pat Summit what she's most proud of? No hesitation. Her son Tyler. Robin to Pat: A lot of women are going relate to the number of times that you tried to have a child. Pat: Seven miscarriages. But I got Tyler. That was the most important thing. Robin: Divorced from her husband since 2008, Tyler has also been Pat's staunchest ally since her devastating diagnosis. He is now following in his famous mom's footsteps. He is the Assistant Coach at Marquette University. He speaks to Pat every day. Tyler: The times that I do worry about her, all I have to do is call. Whenever you talk to her, you don't worry anymore. Robin: Alzheimer's is now a part of Pat Summit's legacy. But how she's chosen to deal with it is just another example of what makes her not only different, but what makes her special. Robin to Pat: Have you had the "Why me?"" moment? Pat: You know, I have had a few of those. Robin: What is it that you want people to understand about you that can help them? Pat: It may not be the best thing, but, you just gotta make it what it is. And just keep living life. Robin: Pat loves to say, "It is what it is." In fact, she has a little sign over her fireplace that says just that. To spend time with her is always just such a treasure. Co-Anchor: You can feel her strength over here. You know, a real teacher shows you. She doesn't tell you, she shows you. That's what she's doing. Did I mention, her players have a 100% graduation rate? If you played for her for four years, you walked away with a degree. And that is something she is very very proud of. Co-anchor: That's as tough a person, a coach, as I have ever seen, watching sports my entire life. She is the bravest and most loving person and I think about her all the time. She is the most energetic person I have ever seen and one of the prettiest ladies in the Southerly tradition. Pat has a HEART Bigger than all of Tenn and the work she did and her accomplishments as a Coach and Mentor for all those LUCKY girls that were on her teams will always remember her and the determination she had and HAS! No other Coach ahs ever and will probably Never match her record. I was fortunate enough to live in TN and got to watch her and her Lady Vols! God will Most Assuredly BLESS this Lady and the wonderful Work she did as she Built the UT Dynasty and the Players Character!